I’ve been on the hunt for an oaty biscuit, nibbly finger that I can make for Ava. Most of the ingredients that I have come across contain banana which she can’t have. I tried to make these in the microwave one morning and they were a massive fail! She hated the texture of them and they seemed really rubbery. I’m pleased to say that with a few tweaks and baking in the oven that they were a success, not only with Ava but Kyle and Finlay too. These are great for a mess free baby breakfast alternative or a healthy snack on the go. Mix all the ingredients together till you can form them into sticky biscuit and finger shapes. Place on a lined baking tray and bake at 200c for 5-10 minutes. These are great to take out with us as a healthy snack for all 3 of them. Ava still has no teeth yet she manages to eat these by sucking on them until they are softer. I’ve since tried these with apple and plum and apple, raspberry and blueberry puree with blueberry and apricot pieces and they are all a big hit. 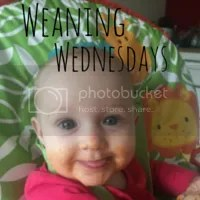 If you like this post head over to #WeaningWednesdays by clicking the badge below. "How I made it to the top 500 in TOTS100"